Price changes, price changes get your price changes here. As this normally goes T-Mobile is making some price changes starting tomorrow on various devices spanning the price spectrum with changes coming to both fully discounted two year contract prices to partially discounted devices. Prices will be changing for the LG Optimus T, Motorola Charm, Motorola DEFY, Samsung Galaxy S 4G, Samsung Galaxy Tab, Samsung Gravity T, Samsung Smiley, Samsung Vibrant, T-Mobile Comet, T-Mobile G-Slate and T-Mobile Sidekick 4G. Check out the full list and see if anything catches your fancy! **Notable price change is the T-Mobile Sidekick 4G currently going for $99.99 after a $50 mail in rebate with a price raise to $129.99 after a $50 mail in rebate. Is it just me or has early upgrade pricing gone down recently across the board on most phones? 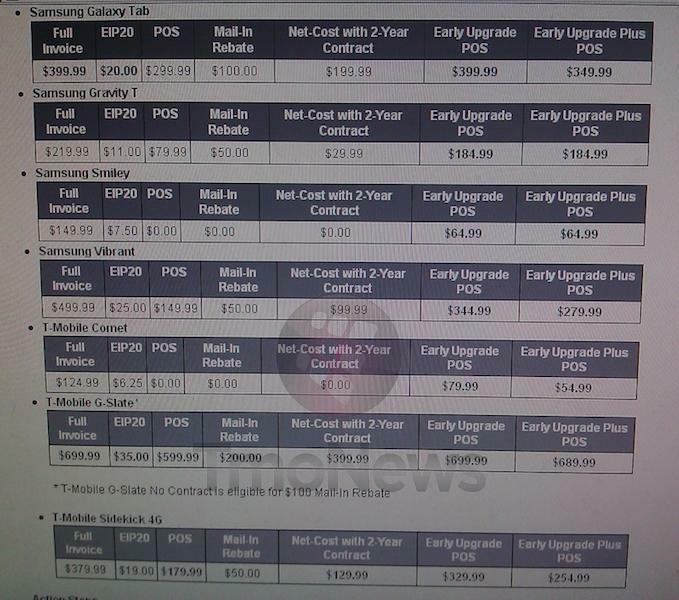 Equipment Installment Plan. You pay over 20 months, equal payments. With a deposit. Wow T-Mobile you really think this is a good way to attract customers with most of them knowing if they sign up with you there’s a good chance that a 2yr contract with T-Mobile may turn out to be a 2 year contract with AT&T? ATT has agreed to honor any commitments made pre-merger post mergers as well. 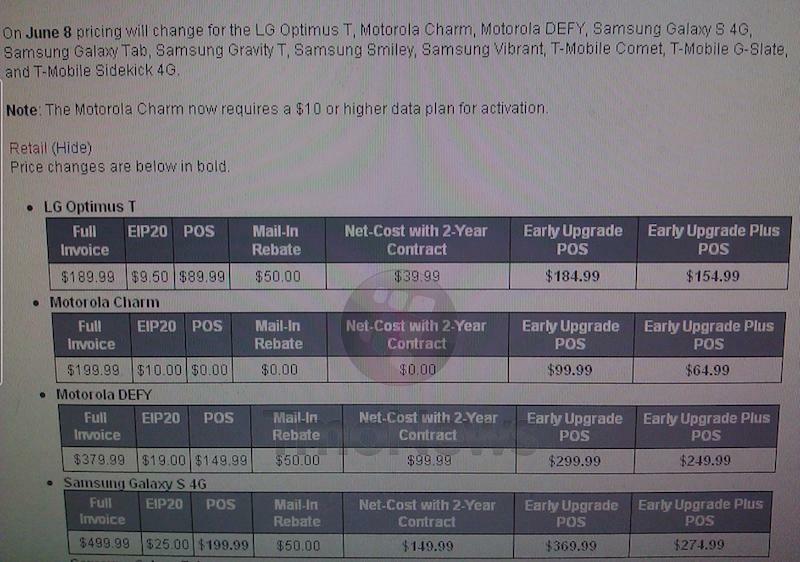 So a 2 yr contract on a Tmobile plan will still be a 2 yr contract with a Tmobile plan. If you wanna keep on using a 4G capabile phone, your gonna have to switch to a ATT phone that will be capable for the new network. If not your 4G phone such as the mytouch, G2, G2x… etc, your internet will not run the same as before. Because that network will no longer be used. that may be true in the future, but not right at the moment of the merger. and on top of that whos to say that the att and tmobile merger is a sure thing? Sorry Perez but that would be incorrect. If the merger is approved, AT&T is NOT instantly going to turn off all T-mobile’s 3G towers. That would be silly. Mz PerezC, That is purely speculation. Since you have NO idea if the merger will be approved nor do you KNOW how the new company will proceed. I understand what you have been led to believe but just as we saw recently with the GX2, what you are led to believe is not always true!!! Thanks Savingjessie, great minds huh? Wow Aaron what type of rationale are you employing? That really makes very little sense. A two yr contract with T MO is a contract with TMO…… whoever you signed with is who you are with. Besides in two years what is it that all you people think is going to drastically change to affect you and your service. Further, the merger has not happened but some people just have to talk about anything….thus the term blah blah came about. This does not relate to this but there is person selling an HTC Sensation on Craigslist in Chicago. Hahahah using our pics no less! I don’t mean to hijack this thread either but I’m really sad that AT&T is getting the sensation as well. This should have been exclusive to Tmo. People whom might have switched to Tmo for this phone will stay put on ATT. And you base your theory on what source. I am with att and I am not staying. Are you with att? Are you staying? isn’t the defy price still the same..? and how do they still have vibrants to sell? What is POS and how does Early Upgrade POS work? If you really want to know, why not google it or anything else you want to know. Seems pretty strange when you have the world at your fingertips to ask a total stranger the definition of such a common term and trust his/her response. Isn’t that what computers are for, INFO, not conversations. What happened to the pursuit of knowledge? @ Jsto5539, what is that supposed to mean? I know people with mental challenges who express ideas better. Obviously the pursuit of knowledge passed you by. Sentences have a subject and a verb. So you want to post but you have nothing to say or have no idea how to say it. Duh Seriously? Thank you Cinnalocks!!! You made me LOL so loud people are staring. So glad I bought my Sidekick 4G on launch day I have not second guessed it since. Got it early for $30 less than what it costs now and when it came out T-mobile was waiving the $18 upgrade fee for the less popular black one. And to think I got it for $99 just 10 months since my last upgrade (Mytouch 3G Slide). Thanks T-Mobile.